CHECK OUT MY STORE FOR MORE HARD TO FIND, RARE AND SIGNED PHOTOGRAPHY BOOKS. Book Description: Chronicle Books 1988. Hardcover in pictorial dust jacket. SIGNED and boldly inscribed and doodled by Peter Beard and M. Marilyn Monroe who appears in 2 images pasted in by Beard across the front end papers, with several more original photographs pasted in, as well as a fold-out exhibition card entitled, "Peter Beard Falling" (see photos). Book Condition: Fine tight clean copy in a fine dust jacket. 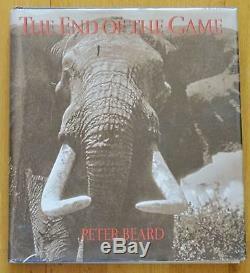 The item "SIGNED With SEVERAL PHOTOS PETER BEARD END OF THE GAME 1988 EDITION HC/DJ" is in sale since Sunday, March 9, 2014. This item is in the category "Books\Antiquarian & Collectible". The seller is "studiobooks1" and is located in New York, New York.